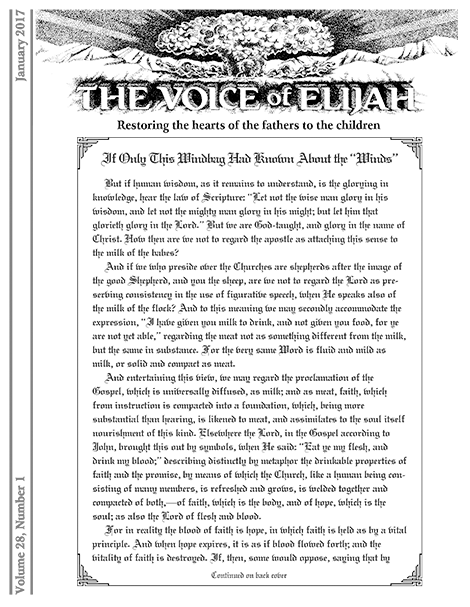 In this issue, the author continues his explanation of the message of the Scriptures that he began in the previous issue. He goes on to explain how both God and Jesus Christ made a will by which They intended to transfer the promise to Their heirs. 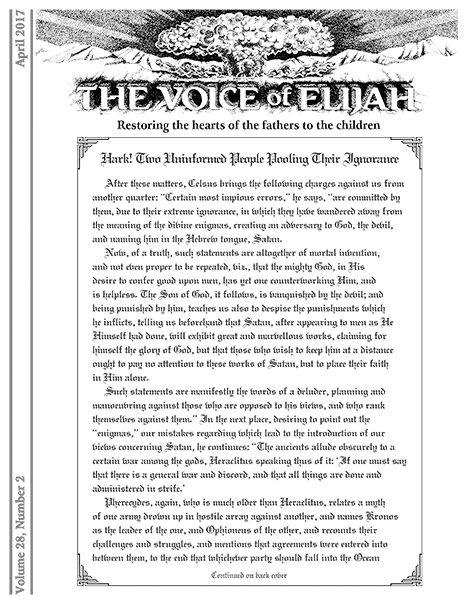 The author concludes with a bibliography of other articles in which he discusses the same topic. In this column, the author responds to a question regarding a woman’s obligation to submit to the authority of the man with whom she has become “one flesh.” He emphasizes the need to understand the nature of authority and the strictures that necessarily inhere in all authority. He concludes by responding to a question regarding the authority of lay men and issuing a warning to those who think he should make things easier to understand. In this issue, the author continues to explain tactics the True Believer can use to triumph over the “winds” that “blow” against them.